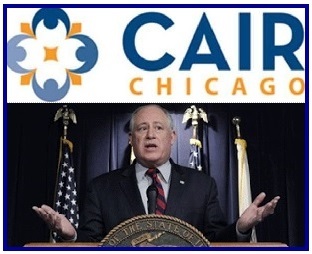 FFA - Illinois Governor Pat Quinn sides with CAIR over national security, bans anti-terrorism training expert from instructing law enforcement officers. The email for this article was deactivated after Governor Quinn declined to remove the ban on Sam Kharoba. The Council on American Islamic Relations (CAIR) has succeeded in influencing Illinois Governor Pat Quinn to stop a nationally acclaimed anti-terrorism educator from instructing law enforcement officers in their state on how to best protect their citizens from terrorism. IR UPDATE: From CAIR Chicago - "Law enforcement trainings with anti-Muslim bigot Sam Kharoba scheduled for next week in Lombard, Elmhurst and Highland Park have been cancelled, thanks to the efforts of coalition partners, community activists and Village officials." The Chicago Tribune reports: Amid protests from a Muslim civil liberties group, local police training officials have called off an anti-terrorism course for officers scheduled for Monday in Lombard that was to have been taught by an instructor the group regards as anti-Muslim. Sam Kharoba’s Counter Terrorism Operations Center has trained more than 20,000 law enforcement officers around the country during the past eleven year. Feedback has been overwhelmingly positive. Kharoba said about 100 Muslim officers have been among the students and that none of them complained about the material. CAIR used the same baseless accusations in their failed attempt to influence the Florida Department of Law Enforcement to ban Kharoba’s skilled training in Florida. The Florida Criminal Justice Training Center Director’s Association declined to change their policy regarding Sam Kharoba and denied the challenge by CAIR on November 1, 2012. It was the training that law enforcement received from experts like Sam Kharoba with the Counter Terrorism Operations Center (CTOC) that saved many American lives from the Muslim-Americans involved in these jihadist plots. If CAIR really desires good Islamic Relations with all Americans they should want highly skilled terrorist experts like Sam Kharoba to help law enforcement agencies root out radical Muslims. Florida Family Association has prepared an email for you to send that urges Governor Pat Quinn to remove his ban on Sam Kharoba and allow law enforcement officers in Illinois to continue to embrace the valuable public safety service that the Counter Terrorism Operations Center (CTOC) provides for all citizens.